Parker Hannifin Skinner Solenoid Valve P/N 12F24C2148AAF4C05, 120 vac, 3/4 NPT, NC, 5-250 psi air, 5-150psi water, 5-100psi oil, Buna N Seals, Brass Body. 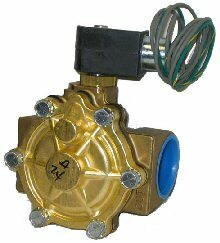 The Series 22/23/24 2-way solenoid valve is Parker's best selling series of Solenoid Valve. The valves are pilot operated and are general purpose solenoid valves for air, water and light oils. The 12F24C2148AAF4C05 120/60 is normally stocked.